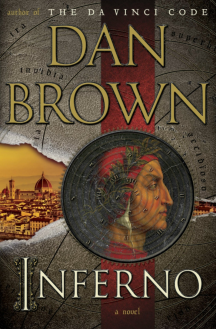 Dan Brown's latest book, Inferno, has everything his fans would expect from him: a nice setting, clues and codes hidden in works of art, conspiracy theories, you get the drift. After all, this is another story centered on Robert Langdon, Harvard professor and symbologist. The story begins with Langdon waking up in a hospital not knowing where he is and without any recollection of the last two days. He narrowly escapes an attempt on his life , thanks to a female doctor, Sienna Brooks. But even with this memory loss, he was able to unlid a sinister plot by a mad scientist to unleash a virus (codenamed Inferno) that will "thin the herd", the herd being us humans. How did he do it? By interpreting hidden codes and symbols in Inferno of the Divine Comedy by Dante. And yes, with a little help from his eidetic memory. Just like any of Brown's novel, this one is filled with details like the height of the building, the make of a car, motorcycle or plane and even the brand of clothes Langdon was wearing. For example, everybody he met thought that changing from a Harris Tweed to a Brioni suit made Langdon look more Italian. If anything, the way he described Florence and Istanbul would make Brown a great TLC travel show host. There is even a tour now of the Hagia Sophia in Turkey based on the book. The book is quite a page turner, I stayed up until 1AM just to find out if the virus will be released. However, somewhere in the last 14 chapters of the book, everything collapsed. Just like the house of cards that one of the characters keeps on talking about (change one card and the entire thing will shift and fall). The frenetic story telling came to a drag and twists after twists were revealed. Personally, the revelations only confirmed what I have suspected since the first few chapters. Maybe it was my desire to prove my self right that kept me reading up to this point. When they were confirmed, my reading energy just dropped. Dan Brown wrote this book with his built-in audience (aka loyal readers) in mind. Critics be damned, the book is a hit everywhere! It even got a publicity boost right here in our country when a government official reacted on Sienna Brook's telling herself that her stay in Manila was like running through the gates of hell. A minor twist in the story which at most, is amusing. Inferno by Dan Brown is available in Kindle edition from amazon.com.